EDIT 9/2010 – If you are looking for rpgKids, you can find it here. 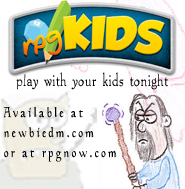 I’ve received numerous comments and emails about rpgKids, and I have to say that I’m extremely happy with the response so far. Parents seem to really be digging playing the game with their kids. I stumbled on this guy’s blog, where he writes a little bit about it. I think I may have to run this at Gencon for the kids, as I saw quite a bit of kids there last year. ← Open Game Table Volume 2 nominations are in! That’s amazing! I dont have kids yet, but that’s something i’ll try! I intend on running a rpgkids version of coppernight hold (the level 1 from dungeon delve) sometime this week. Minions get one hit, regular bad guys 2, and BBEG 3 or 4. I have the tiles and the minis and with these rules combat should go pretty quick.